Every Melissa Foster book I read blows me away and I say every time that the book I am reading is the best Melissa Foster book I have read!….then I read the next one and boom! Completely bowled over! 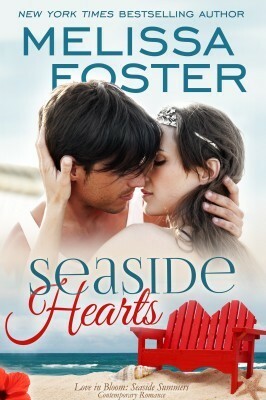 Seaside Heart is by far my favorite (at the time of posting) book in this series…so far! It is the story of Jenna and Pete. Jenna has love Pete for 5 years, but he has yet to notice her! But after her mother’s bizarre behavior Jenna has had enough! Enough of her mother and enough of being over looked by Pete (even though she does it to herself). So she plans her next move, she tells her Mom that until she gets herself back to normal she won’t see her this summer. She also plans to put aside her secret love for Pete and move on…to the hunky contractors on the island. Pete has noticed Jenna, but she is always so painfully shy around him, but herself with her friends. He don’t want a shy miss, he wants someone that is confident in her own skin. Then Jenna makes a date with a contractor and it drives Pete insane. But that is not the only issue that is going on in his life…his family makes life complicated from him too.